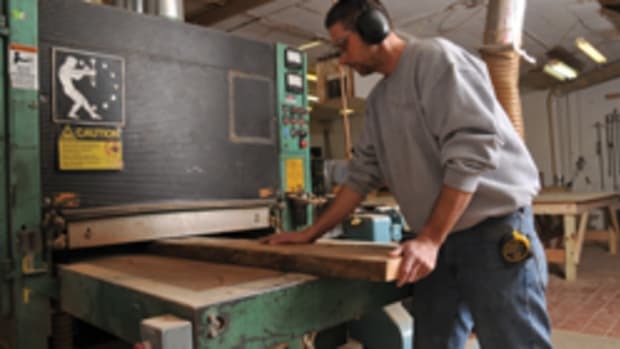 This is a big category, and a woodworker often has to wade through a lot of peripheral information before zoning in on an appropriate piece of equipment. It helps to categorize the forest of information into small, medium and large manufacturers. 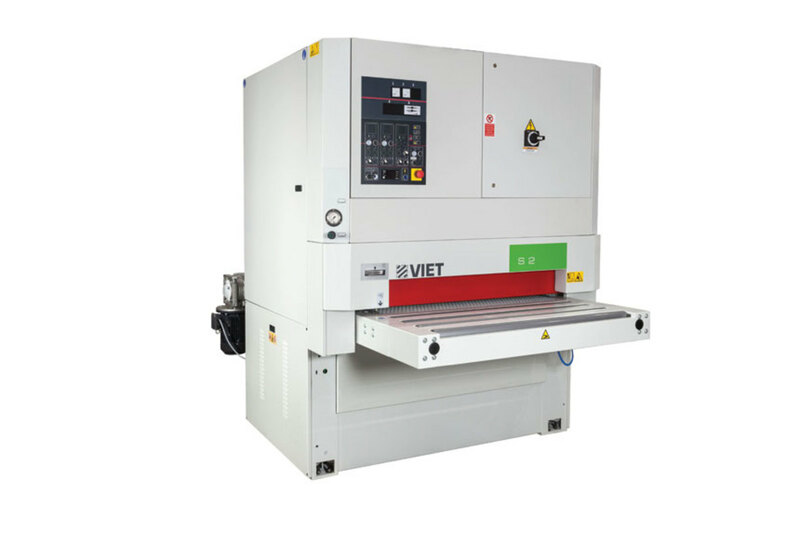 Viet, available from Biesse, introduces the new S2 321 HRK planer/sander to the North American market. It features an eight spiral knife head with four-sided replaceable inserts and 43” working width. SuperMax Tools (supermaxtools.com) is now part of Laguna Tools and is located in St. Paul, Minn. The company’s catalog includes eight drum/combo sanders and two brush models. Four of the former are open-ended, so they can handle wide panels (up to 50”) such as casework sides and cabinet doors. There are also 25” and 37” machines that can accommodate two grits, so that a coarse and a finer pass can be made simultaneously. That can save a lot of time. And SuperMax’s single- and double-brush sanders are designed for sanding raw wood, breaking sharp edges, blending minor defects, sealer sanding, scuffing and profile smoothing of moldings. Jet is part of JPW Industries Inc. and supplies a number of single-phase machines. These include a horizontal/vertical edge sander that tilts 90 degrees on its long axis, so that a part can be face or edge sanded; benchtop and floor model oscillating spindle sanders; half a dozen 48” belt/disc combinations that have either 9” or 12” discs; and seven open-sided drum sanders, five of which can handle panels up to 44” wide on two passes. Delta Power Equipment Corp. (deltamachinery.com) in South Carolina is owned by Chang Type Industrial Co. Ltd in Taiwan. Delta’s line-up includes a floor and a benchtop oscillating spindle sander, a 6” x 89” oscillating edge sander (the up-and-down track of the belt helps prevent hot spots), a 26” drum sander that handles two grits simultaneously, and a 12” benchtop disc sander. Rikon Power Tools (rikontools.com) has an ISO9001 certified factory in Qingdao, China, and U.S. headquarters in Billerica, Mass. 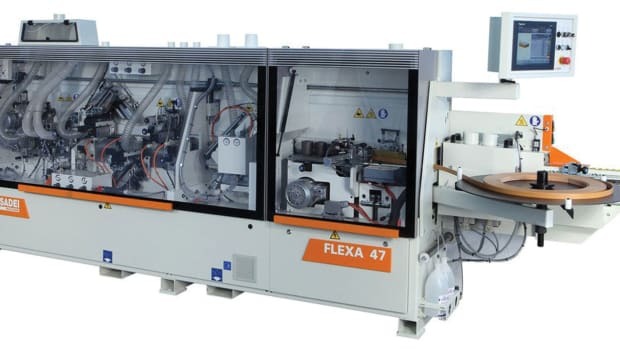 The company offers nine benchtop sanding machines in various configurations, and steel stands for some units. Wen (wenproducts.com) has headquarters in Elgin, Ill., and offers a similar catalog. One of the more unique sanding machines in this category is the precision MicroLux drum thickness sander, designed primarily for model makers and hobbyists (micromark.com). The drum is only 2” in diameter, and the limits on parts are ½” thick and 5” wide. The entire machine is less than a foot long at its widest point. Larick Machinery Inc. (larickmachinery.com) in Fort Collins, Colo., offers eight profile sanders for getting into the most challenging parts of a project. For shops with high volume workloads or large parts to finish, Stiles Machinery (stilesmachinery.com) in Grand Rapids, Mich., offers a huge array of sanding machines. Part of the Homag group, Stiles has regional offices in North Carolina, Pennsylvania, Texas and California. The catalog is sectioned into wide belt and profile sanders plus brush, edge and robotic sanders. The latter, named the Heesemann SZ-2, is a gantry-style robotic sander with up to four separate fields, depending on part size. 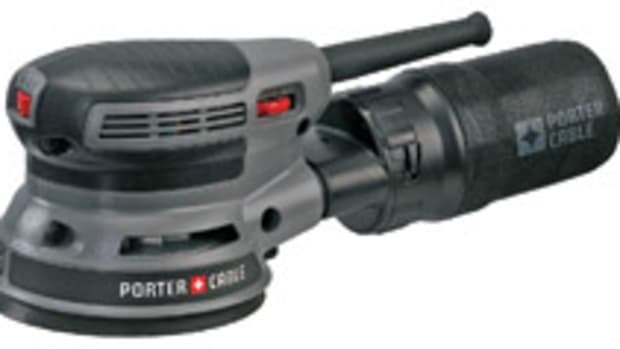 There are multiple heads and multiple sanding belts per head. The sanding head is controlled in at least six axes, and the workpiece is controlled in at least two. Another very specialized Heesemann product from Stiles is the FBA series. This is a veneer/thin sheet sander with remarkable thickness tolerance and a highly accurate height adjustment system. It’s equipped with a patent-pending Billy-roll system for parts greater than 2mm thick, plus thickness monitoring with automatic head adjustment to compensate for belt wear. The accuracy of the machine is up to 0.078”, plus or minus 0.0007”, regardless of the material being sanded. Stiles offers 15 other wide belt sanders including Ironwood models that feature motors up to 40 hp, with widths available from 24” to 52”. Baileigh Industrial (baileigh.com) is located in Manitowoc, Wisc. and Ontario, Calif. The company has an extensive distributor network worldwide, so it’s no surprise that the catalog includes a wide array of sanding machines including drum, belt, open-sided, edge and spindle models. 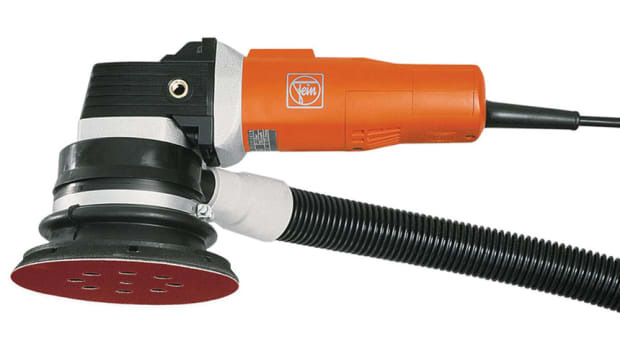 The OS-2424 oscillating spindle sander is a good example of Baileigh engineering. It has a cast iron table that tilts to 45 degrees, and despite running on standard 110-volt, single phase, it weighs in at a stable 320 lbs. Ten different sizes of spindles are included in lengths from 6” to 9”. The company’s wide belt models come in 25” and 37” capacities. Laguna Tools (lagunatools.com) in Irvine, Calif., was founded in 1983 by Torben Helshoj, who wanted to bring high-quality European machinery to the U.S. Laguna offers a dozen sanding machines, from an oscillating spindle sander to the Pro 51” wide belt model. In the middle of the pack, there’s the DDS 38, a 5-hp, single-phase, two-drum sander that can handle parts up to 38” wide and 12” thick. Originally known for its vertical panel saws, Safety Speed (safetyspeed.com) was founded by Gene Olson in 1958 in a small garage in Minneapolis. Today, the company offers a large selection of specialty machines including two American-made wide belt sanders (36” and 42”). One of the grand old names in the industry, Oliver Machinery (olivermachinery.net) can trace its roots all the way back to 1890 in Grand Rapids, Mich. The company offers wide belt, spindle, disc and edge sanders. A good example of Oliver quality is the 6750 disc sander. It has a reversible motor, foot brake, tilting cast iron table and 20” steel disc. Hermance Machine Co. (hermance.com) in Williamsport, Pa., has a huge catalog of new machines and also offers used equipment. 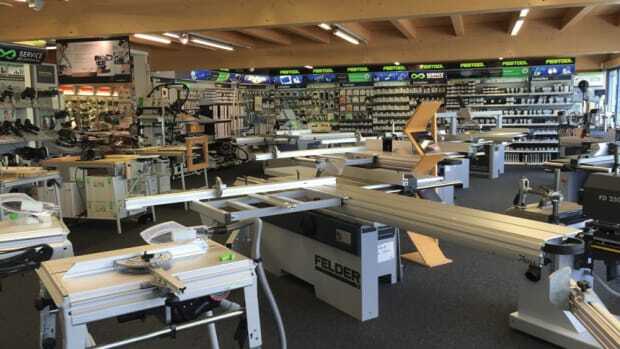 Atlantic Machinery (atlanticmach.com) in New Milford, Conn., carries Volpato edge, profile and stroke sanders along with Casadei wide belt models. The Volpato LS 2N1A is an automatic edge/profile sander with two oscillating belt stations and one abrasive wheel, and the company’s LS 1NR is available with one or more shaper stations and one or more oscillating belt stations and/or abrasive wheels. SCM’s history dates back to 1935, and the company (scmgroup.com) has three locations in North America. It offers Minimax and DCM wide belt sanders, including industrial models that can process both faces of a panel in one pass. In all, SCM offers 15 models, beginning with the DMC SD 10 which the catalog describes as being perfect for small woodworking companies. Felder Group USA is headquartered in New Castle, Del., with showrooms in Dallas, Sacramento, Anaheim, Charlotte, Chicago, Denver and Miami. The company (felder-group.com) offers seven wide belt sanders, three under the Felder brand and four that carry the Format4 logo. The catalog also includes two Felder edge sanders and the Structura 60.02 brushing machine that uses both steel and Tynex brushes to deliver a new face on old wood. Whether you’re just looking at sanding options or setting up an entire shop, the video page on the Felder website is a remarkable resource. 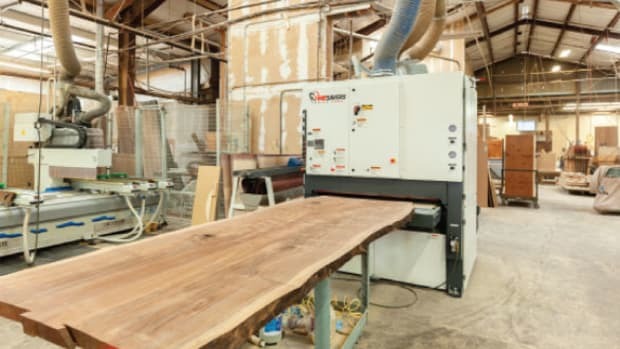 Martin Woodworking Machines Corp. (martin-usa.com) in Charlotte, N.C., offers five Weber wide belt sanders that run the gamut from small to large. This is a subsidiary of Otto Martin Maschinenbau, a leading manufacturer of German woodworking machinery since 1922. Dotul (dotul.com) is known for door manufacturing machinery and the catalog also includes the MT-137, a 37” capacity, three-head wide belt sander. 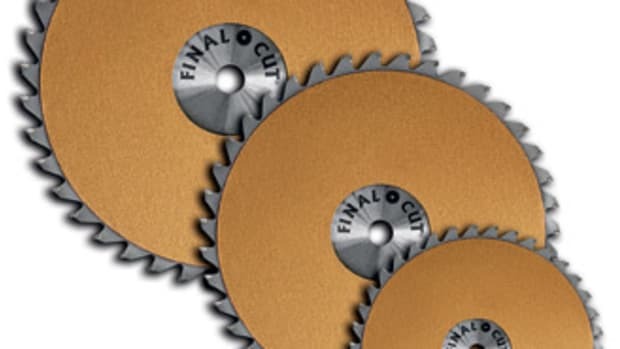 Castaly-Lobo (lobomachine.com) offers a full catalog of sanders in every configuration, including shape-and-sand machines, profilers, edge sanders, molding and finish units, double drums, curve and round models, belt, disc, brush (texturing), and of course wide belt sanders. 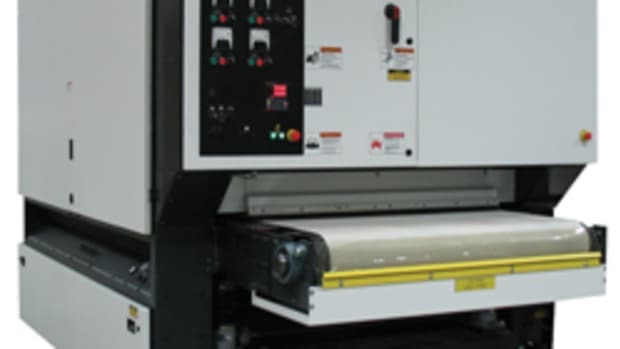 NexTech Machinery Inc. (nextechmachinery.com ) has recently opened a new facility in Cornelius, N.C., and currently offers four wide belt sanders. The smallest is the S37-C, designed for entry-level tasks. The largest is the PS52-PRC planer/sander, which handles work up to 51” wide and also has a steel helical planer head driven by a 40-hp motor for increased stock removal. Doucet (doucetinc.com) is located in Quebec, Canada, and known for specializing in industrial-grade stroke sanders of every size. And Voorwood Precision Machinery (voorwood.com) has been building specialty machines since 1961. Headquartered in Anderson, Calif., the company offers sander/shapers that are capable of processing all components of a five-piece cabinet door. Tennessee-based Powermatic (powermatic.com) is also part of JPW Industries and supplies both small and large sanding machines. Included are disc/drum units, stand-alone disc sanders, drum sanders, two tilting edge sanders, and a family of five wide belt sanders. These latter range from a 5-hp, single-phase, open-sided unit that can handle parts up to 32”, all the way up to a 25-hp model with a 43” capacity. General International (general.ca) is another company that straddles both spheres. Its model 15-275X is run by a 7-1/2-hp, single-phase, 220-volt motor, and it weighs in at 1,170 lbs. At the other end of the scale (and there are 19 sanding machines in the catalog), is the 15-142, a 1” to 2” wide and 42”-long detail benchtop machine. One of the nice aspects of the General collection is that several machines offer a choice of single- or 3-phase supply, and also various horsepower ratings within the same machine. Shiraz Balolia owns Woodstock International and Grizzly Industrial. Born in Kenya, he began with one employee and worked 16-hour days for many years to establish what is now a household brand. In 1999, he opened offices in China and Taiwan, and brought quality control in-house. Since then, thousands of U.S. woodshops have grown with his brands. The catalogs for Grizzly (grizzly.com) and (woodstockint.com) are similar, although Grizzly’s machines get a little larger at the professional end. Woodstock offers product under its own brand and also as both Shop Fox and Steelex, and the company lists 26 sanding machines in its catalog. Of those, six are wide belt sanders with capacities from 20” to 43”. There are also five drum sanders and a number of smaller, stand-alone and benchtop machines. In the Grizzly catalog, the top end machine is a 30-hp, 51”, double-headed wide belt sander called the G0487. The first belt runs on a single drum and the rear belt runs on a platen system, which allows the operator to adjust the sanding depth. Shops that are changing belts on a single-head machine can cut sanding time by more than half with this setup. Opti-Sand (opti-sand.com) in Geneva, Ill., offers a catalog of creative, intelligent machines designed for sanding moldings, flooring, linear parts, doors, drawer fronts, face frames, and more. Ridgid’s model EB4424 (available through The Home Depot) is a benchtop oscillating belt and spindle combination machine designed for light duty. It has a hinged front table that drops as much as 45 degrees, and this allows woodworkers to sand inside curves at an angle. Grainger (grainger.com) offers a number of Dayton small sanding machines, and some of these are also available online through the Walmart website. It’s one of the most visible and tactile signs of a good job.